When you’re on the trail for days at a time, choosing the right pack can make all the difference. 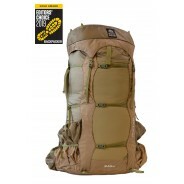 But often times, finding a pack that’s tough and functional, while also providing a perfect fit can be a challenge. This is the Lutsen 55, the largest of Granite Gear’s new Lutsen-Series multi-day packs. Designed with lightweight, durable and water-resistant materials, the Lutsen 55 represents an optimum blend of longevity and performance. In addition to this, it includes all the features you need to keep moving smoothly on the trail. With water-resistant zippered compartments, large stretch woven pockets and adjustable tool holders, the Lutsen 55 keeps your things safe, organized and close at hand. But most importantly, the Lutsen 55 comes equipped with Granite Gear’s innovative Re-Fit Air Current suspension, a system that allows for a fully customized fit that can be adjusted anywhere. The system works by providing easy access to minutely adjustable settings in both torso length and waist size. To adjust for torso length, you’ll simply break the hook-n-loop connection at the base of your shoulder straps, and realign it using clearly-marked indicators that correspond to your torso length. Adjusting for waist size is just as easy. You simply slide the hip-belt from behind the ventilated back-panel, and adjust the hook-n-loop connection to match your waist size. After customizing your Air Current Suspension, an already superior load-transfer system becomes specific to your body type, and allows you to carry your gear over long distances as comfortably and efficiently as possible.